Cape Town (13 July 2017) – The Zeitz Museum of Contemporary Art Africa (Zeitz MOCAA) will open to the public at Cape Town’s V&A Waterfront on Friday, 22 September 2017, the world’s largest museum dedicated to contemporary art from Africa and its Diaspora, designed by internationally acclaimed Heatherwick Studio based in London. The museum will be housed in 9,500 square metres of custom-designed space, spread over nine floors and carved out of the monumental structure of the historic grain silo complex. The grain silo, disused since 1990, stands as a monument to the industrial past of Cape Town and was once the tallest building in South Africa. Now, it has been given new life through a transformation by Heatherwick Studio. The galleries and the cathedral-like atrium space at the centre of the museum have been literally carved from the silo’s dense cellular structure of 42 tubes that pack the building. The development includes 6,000 square metres of exhibition space in 80 galleries, a rooftop sculpture garden, state-of-the-art storage and conservation areas, a gift shop, a restaurant and bar, and various reading rooms. The museum will also house Centres for Photography, Curatorial Excellence, the Moving Image, Performative Practice, Art Education, and the Costume Institute. The R500-million (£30-million) development of Zeitz MOCAA, announced in November 2013, has been created in a partnership between the V&A Waterfront and Jochen Zeitz as a not-for-profit cultural institution in the heart of one of the most visited cultural and historical hubs in Africa. Set on the edge of a natural, historic working harbour, with the iconic Table Mountain as its backdrop and sweeping views of the ocean, City Bowl and mountain peaks, the V&A Waterfront attracts up to 100,000 people a day. Thomas Heatherwick, founder of Heatherwick Studio, says, “The idea of turning a giant disused concrete grain silo made from 116 vertical tubes into a new kind of public space was weird and compelling from the beginning. We were excited by the opportunity to unlock this formerly dead structure and transform it into somewhere for people to see and enjoy the most incredible artworks from the continent of Africa. “The technical challenge was to find a way to carve out spaces and galleries from the 10-storey-high tubular honeycomb without completely destroying the authenticity of the original building. The result was a design and construction process that was as much about inventing new forms of surveying, structural support and sculpting, as it was about normal construction techniques. “As the opening approaches, we are all looking forward to witnessing the impact of the museum’s ambitious artistic programme and the museum taking its pivotal place in the middle of Africa’s cultural infrastructure”. The Zeitz Collection was founded in 2002 by entrepreneur Jochen Zeitz and is regarded as one of the most representative collections of contemporary art from Africa and its Diaspora. Its mandate is to collect and preserve contemporary cultural artefacts of and from Africa. The Zeitz Collection is held and exhibited in spaces in Switzerland, South Africa, Spain and through an extensive presentation of art at Segera Retreat in Kenya. The Zeitz Collection collaborates, on an ongoing basis, with the Zeitz Foundation for Intercultural Ecosphere Safety. As part of the 4Cs philosophy (conservation, community, culture and commerce), the Zeitz Foundation supports creative activities that strengthen intercultural relationships and understanding, raises awareness of cultural diversity, and inspires others to act in kind. The Zeitz Collection Curator, Mark Coetzee, acts as the cultural specialist for the Zeitz Foundation. Both organisations collaborate on cultural outcomes at the Foundation’s headquarters based at Segera, Kenya, and globally. The 123-hectare V&A Waterfront blends commercial, residential, retail, cruise, leisure and entertainment within a contemporary working harbour with 22 historical landmarks. The V&A is a flanked by the scenic beauty of the sea and Table Mountain and is adjacent to the vibrant city centre and the Cape Town International Convention Centre. Since 2002, the V&A Waterfront has nominally contributed R335.4-billion to GDP, accounting for nearly 2% of the direct value of the entire province of the Western Cape. By 2016, the V&A had created more than 50,000 direct and indirect jobs. With 25-million annual visitors, the V&A remains a favourite destination for international visitors as well as a retail, leisure and entertainment hub well-frequented by locals. In September 2017, the Zeitz Museum of Contemporary Art Africa (Zeitz MOCAA) opens. This is a significant cultural gift from the V&A to Africa and will house the largest collection of contemporary art from Africa and its Diaspora. The V&A is further developing a world-class cruise terminal––in walking distance of Zeitz MOCAA––that it manages on behalf of the National Ports Authority. 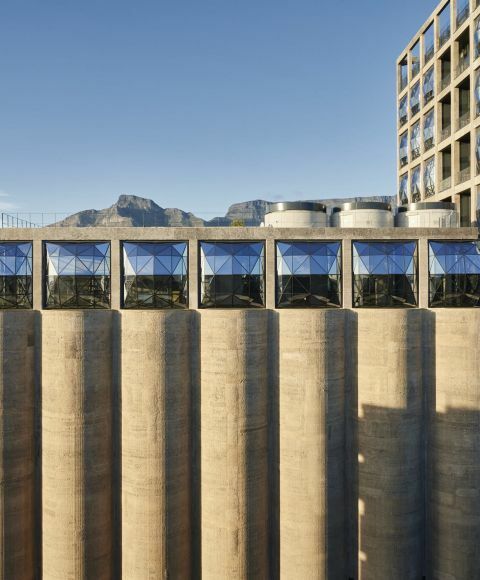 The not-for-profit institution Zeitz Museum of Contemporary Art Africa (Zeitz MOCAA) will be housed in the historic grain silo complex at the V&A Waterfront, Cape Town, with the V&A committing more than R500-million to the development required for the establishment of the museum. Built in 1921, and at 57 metres tall, the grain silo remains an icon of the Cape Town skyline. This investment will further the development of art in Africa and acknowledges the important cultural and financial contribution the visual arts sector provides to the continent. The silo building has been a part of the Cape Town skyline for almost 90 years and, until the turn of the millennium, has been at the heart of the operational life of the city’s waterfront dock, facilitating the collection, sorting, storing and exportation of much of the country’s grain. Completed in 1924 by SA Railways and Harbours, it has processed hundreds of thousands of tons of wheat, maize, soya and sorghum. Its location was driven by its connectivity to the docks and the resultant rail infrastructure. So much is the building a principle part of the city’s urban character that it has been heritage-listed by the authorities. The over-arching vision is to redevelop and restore it in such a way that brings national and international interest in a manner that breathes new and sustainable commercial and cultural life to the building. British designer Thomas Heatherwick founded Heatherwick Studio in 1994 to bring craft, design, architecture and urban planning together in a single workspace. Today, a team of 200––including architects, designers and makers––work from a combined studio and workshop in King’s Cross, London. Rather than identifying with any particular style or aesthetic, Heatherwick Studio is best characterised by its working methodology. The studio explores and tests responses to produce a design that fulfils the spirit and the letter of the brief in an inventive way. This process is independent of scale: From developing a chair or a masterplan, the same system of collaborative inquiry and experimentation is applied. The studio’s completed projects include a number of internationally celebrated buildings, including the award-winning Learning Hub at Singapore’s Nanyang Technological University and the UK Pavilion at the Shangai World Expo 2010. The studio is currently working on approximately 25 live projects on four continents. Current projects include a landmark for Hudson Yards in Manhattan, major new headquarters for Google in both Silicon Valley and London (in collaboration with BIG), and Coal Drops Yard, a 100,000-square-foot retail quarter in London that makes use of two historical coal-drop buildings. For more information, visit heatherwick.com.